The French press was originally patented by two Italians, Attilio Calimani and Giulio Moneta in 1929. Shortly after in 1958, a Swiss man by the name of Faliero Bondanini mass produced a model that is widely used in coffee shops and households today. Bondanini manufactured it out of an old French clarinet warehouse and gave it the name Chambord. The initial popularity of the final product in France gave it the name we know today; the French Press! With this brief background now, would you consider this a French, Swiss or Italian product? Leave us a comment below with your ideas! The French press is a full immersion brewing process with a mesh filter that allows the natural oils to come out through the coffee. This process is similar to steeping tea or brewing a cup of coffee using an Aeropress. 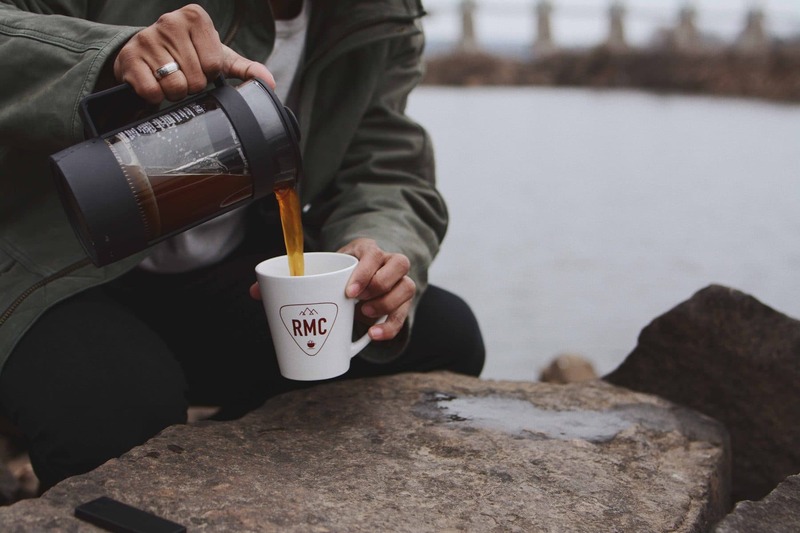 The oils are what gives the French press its mouthfeel and full bodied flavor, which typically results in a bolder cup of coffee versus other methods. Because the French press is a full immersion coffee brewer, it is important to grind the coffee so the final product particle size is similar to that of course sea salt. Most modern in-home burr grinders will have a ‘French Press’ setting, be sure to use this! If it is not explicitly labeled, use the more coarse grind option available. Coffee ratios are key to brewing the best cup of coffee at home. This is where the importance of using a scale comes into play. Here at Round Mountain Coffee, we use a 1:15 bean to water ratio. There is no correct or ‘best’ ratio! Feel free to experiment with other ratios. A helpful tip is if the coffee is tasting too bitter in the end, increase the ratio (1:17 ratio) and likewise if it is not strong enough, lower it (1:13 ratio). There’s so much more than goes into making an awesome cup of coffee from a French press. Here are few more tips for you! Give the slurry (slang for the coffee/water mixture in the press) a stir after you finish pouring the water. Stirring allows the coffee to not settle as quickly which yields a more even and flavorful extraction.